Hey guys we are back with another vlog. 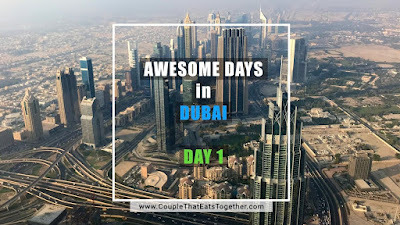 We spent awesome 10 days in Dubai. Here is vlog of day 1 of our journey from Mumbai to Dubai. 20 September 2017 a day before our travel due to heavy rains in Mumbai a SpiceJet flight overshoots runway and gets stuck in mud, over 180 flights cancelled and main runway was closed for operations. We were worried that our flight was going to get cancel, Due to heroic efforts of Mumbai airport team plane was removed the runway and the airport was back to normal operations by around 9:00 am in the morning. We finally began our journey to Dubai. Air India express flight was on time and we reached safely. After landing on airport we bought tourist sim card from "du" outlet at the airport. It is cheap and has some welcome offers (free uber rides, coupons etc...) We caught taxi outside from Airport. All taxis goes by meter 👍🏼 no need of haggling and we travelled in black lexus car to our hotel Jumeira Rotana on 2nd December Street. After quick nap we got ready for our dinner at Jamie's Italian by famous chef Jamie Oliver which is located inside luxurious Jumeira Beach Hotel. Kaustubh already reserved the table with Zomato app. We had the signature Posh chips by Jamie, the super delicious fish in the bag (a must try) and crab pasta. That's it for day 1 stay tuned for more videos from our dubai journey. Hotel we stayed : Jumeira Rotana, 2nd of December Street - Dubai - United Arab Emirates. Click Here To Anushka Sharma And Virat Kohli Are Married.